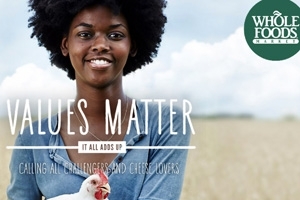 Image from Whole Food's "Value Matters" Campaign. Credit: Whole Foods. On June 16, Amazon surprised many experts when it announced its intention to purchase Whole Foods at $42 per share ($13.7B) - a move that was hinted at by their recent experiments like "Amazon Fresh" and "Amazon Go." We knew this major acquisition meant a big change in the business world-a fusion that would effect each companies' products and customers alike. Nelson Amaral, Assistant Professor of Marketing, is a consumer psychologist who investigates the way consumers process information, and the relationships they form with brands. He's got broad marketing experience in four industries, both B2B and B2C, and has been published in The Journal of Consumer Psychology and the Journal of Experimental Social Psychology. Initially, it should come as no surprise that most experts are very supportive of this deal (share prices of both companies, Amazon and Whole Foods, rose following the announcement, while the market value of every major grocery competitor fell). For example, by purchasing Whole Foods, Amazon has acquired a retail business with higher margins than its own (5% vs. 3%). Also, Whole Foods has a loyal customer base that should provide Amazon lots of data in this traditional retail setting that can be used to inform future innovations. While the acquisition of Whole Foods may appear to be ideal, research by consumer psychologists points to a number of challenges that may need to be addressed: (1) consequences of perceived differences in corporate culture, (2) perceived changes to the Whole Foods brand, and (3) potential changes in expectations about the personal connection between Whole Foods and its customers. Corporate cultures develop organically and, as a result, are stable and hard to change. They are also often tied directly to brand perceptions (i.e. what consumers think of the brand(s) associated with a company). For example, Amazon's brand is associated with success, low-cost operations and ruthless innovation - no surprise given that they've fundamentally changed the way people shop and, earlier this year, became the fastest company to ever reach $100 billion in sales. Likewise, its corporate culture is associated with a survival of the fittest philosophy, resulting in high employee turnover due to relentlessly high standards and pervasive burnout. Amazon succeeds with this cut-throat culture because it has fostered an innovative and collaborative set of systems and a recruiting strategy that provides it with a never-ending supply of young, bright graduates. In contrast, Whole Foods is perceived as an organization that not only provides healthier natural foods, but conducts its business with both consumers and suppliers on the basis of "enlightened" values. By pursuing this differentiation-based marketing strategy, Whole Foods has chosen to focus on customer service, high-quality products, and exceptional in-store experiences. This incongruity between the two cultures may cause some internal difficulties at the corporate level but, more importantly, even if the transition at the organizational level is seamless, consumers' perceptions about this incongruity may pose some serious challenges. In particular, it's important that the Whole Foods brand continue to be seen as authentically- based on its presently associated values. Research has demonstrated that when an incongruity between two items is present, consumers actively increase the amount of effort they expend toward understanding the relationship between the pair. As a result, Whole Foods should expect its customers to be searching for evidence that the acquisition hasn't influenced their corporate values. Especially in the early weeks and months following the acquisition, consumers are likely to be hypercritical of any changes in product assortment, corporate communications, and marketing strategies. A second issue that Whole Foods will need to navigate is the association that this acquisition conveys about Whole Foods moving away from the "niche" (i.e. little guy) business it started out as, and towards the big corporate America that Amazon exemplifies. Generally speaking, we know that people like to root for the underdog, and research has shown that this is in large part because we believe the underdog works harder. In the United States, where work ethic is intrinsically tied to our overall evaluations of individuals, the purchase of Whole Foods by Amazon can negatively affect how consumers view Whole Foods in two ways. First, once Whole Foods is no longer seen as the underdog, there is less motivation to feel a personal affinity towards the brand (i.e. to root for its success); secondly, because work ethic plays such an important role in our evaluation of others, if Whole Foods' future success appears to be driven more by Amazonesque efficiency, as opposed to high levels of personal effort in selecting products and serving customers, a key element of the Whole Foods brand identity can be significantly diluted over time. Investors are probably most excited about the potential technological changes that Amazon can implement to improve the customer experience, while also significantly cutting labor costs through automation at several points of the grocery shopping experience. Amazon has obtained much of its success by recording every transaction, knowing more about every consumer, and every element of the businesses inventory, than any other retailer. While this level of service is well-suited to online retail, it may be inconsistent with the expectations of Whole Foods' customers. At Whole Foods, customers expect sales agents to go above and beyond, walking through an aisle to help find a product, helping carry groceries to the car, etc. In stark contrast, four years ago, Amazon introduced "Amazon Go," an application that shoppers could use to buy all of their groceries without ever interacting with a store employee by roaming the aisles and scanning their products with their phone and simply walking out when they finished shopping. This is not to suggest that any attempt to use technology at Whole Foods will be viewed negatively by its customers. But it does highlight the importance of Amazon's choice in technologies to implement so that they're consistent with the Whole Foods brand. For example, a story in The Economist recently highlighted how the use of facial recognition by French retailers increased sales by 10% by dispatching clerks to consumers when the software detected any dissatisfaction, confusion or hesitation. Despite the challenges that have been highlighted in this article, the last example makes it clear that the potential to improve the bottom line while simultaneously maintaining or improving the customer experience at Whole Foods is definitely possible. Also Amazon's track record of success suggests that they're absolutely capable of making this acquisition a success all of the stakeholders, including Whole Foods customers. Like any acquisition though, several serious challenges will need to be addressed if such broad-based success is to be realized. Nelson Amaral is an Assistant Professor of Marketing. His research investigates the way consumers process information, and the relationships they form with brands. His work has been published in premiere journals and presented throughout North America; his research on luxury brands has been presented in Singapore, Monaco, France and Portugal.